Are you taking good care of your furnace? If not, you could be surprised by an emergency furnace repair later this winter. Fortunately, you can schedule furnace maintenance with any of our HVAC technicians so you can avoid an expensive heating repair. We’ll be able to examine your furnace to catch small issues before they grow. Continue reading to learn how requesting furnace service can help you save money and energy in the long run. Some warranties require that you have your heating furnace serviced annually. If this is the case, you’ll want to keep up on furnace maintenance. In our experience, the most expensive repairs are usually for home furnaces that haven’t been serviced in years. During a furnace service visit, a technician has the chance to repair small damage before it grows into a more expensive heating repair. Carbon monoxide is a colorless, odorless, and tasteless gas that causes 500 deaths and 15,000 trips to the ER each year. To protect your family from carbon monoxide leaks, you’ll want to schedule furnace maintenance this year. While small levels of carbon monoxide exit the exhaust, there shouldn’t be any traces of the gas inside your home. A HVAC technician will be able to inspect the venting, gassing, and electrical mechanisms to make sure they work properly. A HVAC technician will be able to help your forced air furnace run more efficiently this winter. For example, changing a dirty furnace filter reduces how much energy your furnace uses to produce heat, which saves you money in the long run. A dirty filter forces your furnace to work harder to produce the same amount of heat. Not only does this reduce your home’s energy efficiency, but it also decreases the usable life of your furnace. Eventually, your furnace will need to be prematurely replaced. Depending on the type of air filter your house furnace uses, you’ll want to make sure you replace the filter every 3 months. While a technician can replace the filter for you during your annual furnace tune up, you’ll want to make sure your filter doesn’t get clogged in between visits. If you or a family member has allergies, you’ll especially want to make sure the furnace filter is changed on a regular basis. Furnace filters are responsible for trapping allergens such as dust, dirt, pollen, and pet hair. 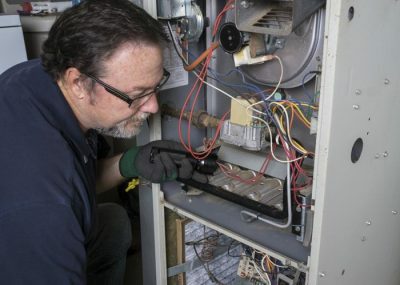 Our HVAC technicians work hard to earn your business by offering a range of heating and cooling services, including furnace maintenance. To request furnace service, call Parker-Arntz Plumbing & Heating, Inc.at (616) 225-9150.